Littorio was one of the three Italian Littorio class battleships operating during the Second World War, belonging to the Italian "Regia Marina”. Littorio (Lictor), in ancient times, was the bearer of the Roman "fasces”, which was adopted as the symbol of Italian Fascism. Following the now tried and tested formula that Kagero have made their own, this book is superbly produced and with the subject matter being one of the most good looking battleships, it will become a must have for any maritime modellers. 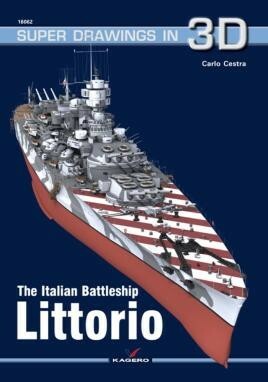 With the future release of the Littorio in 1:350, by Trumpeter, this book couldn't have been released at a better time for the modeller to start collecting their references. For the scratch-builder, this book would be invaluable.